Mr. Tim Ehlen, organizer of Building Catholic Communities, has agreed to speak at our conference. 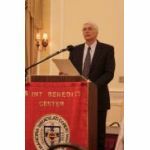 “Hungry to rediscover the rich history and tradition of community life based on Catholic principles,” Mr. Ehlen began Building Catholic Communities as “an informal confederation of scholars, architects, religious and lay leaders” to study and advance such ideals. The Revival of the Catholic Land Movement.